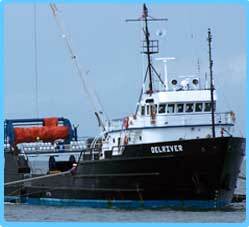 The Delaware Bay and River Cooperative, Inc. In 1977 members of the Oil and Transportation Industries in the Delaware Valley joined to found what has emerged today as the Delaware Bay And River Cooperative. The “DBRC” is a not-for-profit corporation organized to respond to and offer protection from oil spills in the Delaware Bay and River area. It is the responsibility of DBRC to plan for and respond to oil spills on water in the Delaware Valley from the mouth of the Delaware Bay to the Betsy Ross Bridge in Philadelphia, PA. The Delaware Bay and River Cooperative is composed of member companies who receive, produce or transport oil on the Delaware River and Bay. Members and Subscribers have access to large quantities of oil spill response resources to meet their regulatory requirements for oil spill response. All of the DBRC’s resources are available for use 24 hours per day and are dedicated to the Delaware Bay and River. Our emergency response equipment is strategically located throughout the Delaware Bay to better respond to oil-spills and emergencies. Click on the links below for detailed information and emergency contacts. View DBRC membership benefits and classes of membership. Email the Delaware Bay and River Cooperative with any questions or comments.